We’re willing to do everything we can to get our patriotic message out to as many people as possible, and that stage would be a great way to do it. 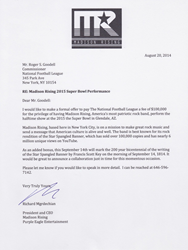 Madison Rising, America’s most patriotic rock band, has sent a letter to NFL Commissioner Roger Goodell offering the league a lump sum payment of $100,000 for the opportunity to perform at the halftime show at Super Bowl XLIX to be held in Glendale, AZ on February1, 2015. The offer is in response to an August 19, 2014 report by the Wall Street Journal and other sources that the NFL has requested that performers pay the league for the privilege of participating in the show. As an added bonus, this year marks the 200 year bicentennial of the writing of the Star Spangled Banner by Francis Scott Key on the morning of September 14, 1814. It would be incredible to announce a collaboration with the NFL just in time for this momentous occasion. Madison Rising released its widely acclaimed version of the Star Spangled Banner in the summer of 2012 and both the song and video have become huge hits throughout the country, catapulting the band into the national spotlight and creating one of the most loyal fan bases in rock music history. “Awesome,” “deeply moving,” “chilling,” and “the best ever,” are just some of the superlatives used to describe Madison Rising’s rendition of the song that celebrates what being an American is all about.